NEW! Now have a lifesaving device in your hands at all time. 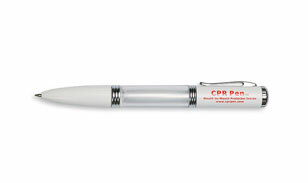 This pen has a built in face shield designed for CPR. Same type of product inside a CPR keychain. The Mouth-to-Mouth Protector is small enough to fit inside the specially designed pen barrel but large enough to help protect the rescuer. To use it, unscrew the top cap, remove the face shield and tear open the packaging along the tear line. Only those trained in CPR should use this device.